Will hair dye developer make it possible to dye polyester with Rit dye? for dyeing polyester! It can also be used for nylon. There is nothing that will work to fix Rit dye on polyester. Rit All-Purpose Dye simply cannot be used to dye polyester! It can be used to dye cotton, silk, rayon, and nylon, but never polyester, no matter what chemical, fixative, or dye developer you try to add. 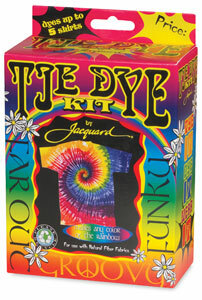 Hair dyeing products will not help in dyeing polyester, regardless of what type of dye you use. Polyester cannot be dyed with any dye that works on natural fibers. If a dye can be used to dye cotton, silk, or wool, then it will not work for polyester. The only type of dye that will work on polyester is a class of dyes that is named “disperse dye”. (See my page, Dyeing Polyester with Disperse Dyes.) Sometimes you will see disperse dye being sold under the name “transfer dye”, because disperse dyes can be used to make designs on paper that are then transferred to polyester by pressing with a hot iron. To find a company that will sell you disperse dye in the UK, take a look at my page, “Sources for Dyeing Supplies Around the World“. You can order disperse dyes online in the UK from George Weil, Kemtex Educational Supplies, Omega Dyes, and Rainbow Silks. A dye carrier that is sold by some dye suppliers for use with disperse dyes can be used to make the colors of disperse dye more intense. This is available under different names, but only from textile dye suppliers. 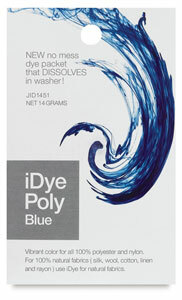 IDye Poly, a brand of disperse dye marketed in many different countries by Jacquard Products, comes with a dye carrier included in a separate packet within the package of dye; PRO Chemical & Dye, a dye supplier in the US, sells a chemical called Dye Carrier NSC for this purpose. Dyeing polyester requires extensive application of high heat. In addition to the special polyester dye, if you will be immersion dyeing fabric or clothing, you will also need a large non-reactive cooking pot, one which you plan never to use again for food. The pot must be large enough for the material you’re dyeing to move about freely in the boiling water. By non-reactive”, I mean a stainless steel pot, or an enamel pot with no chips in the inner lining. Do not buy an aluminum or cast iron pot for dyeing polyester. This entry was posted in dyeing polyester, fixing dye on August 25, 2014 by pburch.